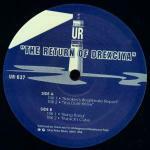 1996 brought the importantly titled 'The Return of Drexciya' 12" EP on UR, but returning from where? It seems likely that it would be from their journey home. If so you would then expect this release to provide clues or information on this place, which it does not, instead we only have a warning. This cautionary tale hangs on the subtitle, 'You Don't Know What Lurks in the Fog'. The first part of the phrase comes from the last track on side A, 'You Don't Know', with the remainder of the text found in it’s entirety etched into the run out groove on the same side. The artwork continues this theme with a drawing of a lighthouse surrounded by fog. The aquatic theme is obvious, but what exactly lurks in fog near a lighthouse? Rocks of course, so now we have a metaphor for what we are dealing with. Rocks would certainly scupper the best made boats and likely end in death for anyone on board. So now we know the nature of the warning is of a potentially life-threatening situation. Musically the EP begins in a very uncharacteristic way for Drexciya with who I presume is a friend of theirs called Smokey doing a rap, but basically just taking. This side is cut at 45 which gives his voice a helium induced quality which is easier to follow pitched down. Drexciya provide a slow droning sound which underlies his vocal that starts off, “Yeah dog check my mic, yo yo yo yo this is Smokey coming at you straight otta Detroit dog, giving it up for the Drexciya report, because I know it dog, man I seen these brothers man, walking down Grant? Avenue one day, and a brother got wronged." The rest of the rap is sadly largely unintelligible to my ears but I think what happens next in the story concerns some feat of heroism on the part of Drexciya with Smokey finishing up telling us to trust them. What this is all about and why it’s titled ’Smokey’s Illegitimate Report’ is anyone’s guess. It’s either a bit of fun on their part or maybe sets the tone for the coming lesson/report. It’s a strange start to a strange release. ‘The Return of Drexciya’ as a title and concept, in the title alone, does make sense in the way I’ve already explained but the reality of what’s contained on it doesn’t really follow on from Drexciya 1 - 5 and 'Aquatic Invasion'. Looking back over some notes I made awhile back when I was sketching out some idea’s about this EP I wrote that it was like Grava 4 without the punch-line. In a way this is Grava 4 in that it appears to be the final record in this instalment but it doesn’t conclude anything that went before it. What it does do is create more confusion which is only continued on the next release ‘Uncharted’. Does this mean I just can’t figure it out or does it have a meaning at all? I guess we’ll have to consider the rest of the tracks and artwork. The title ‘Bang Bang’ brings to my mind that odd when you think about it child’s phrase ‘Bang, Bang, your dead’. But the track itself uses this phrase, with a male vocal, as nothing more than a percussive element along with a few similar vocalisations to the same effect. Musically it’s a light moment, minimal and effective, certainly not unpleasant but slight compared to what their capable of. ’Rublicks Cube’ is my favourite with some nice sweeping 303 action and a slowed down vocal saying the title over and over. At the end of the track with most of the music stripped away I detected a curious sadness in this repeated phrase which was not evident before this point, but that could just be me. Certainly Rublicks Cube does reference a puzzle which is exactly what we have been unravelling so far so maybe this is some acknowledgement of that on their part. Why they spelled it this way instead of Rubik might be them playing it safe for trade mark copyright reasons. ‘You Don’t Know’ itself is a fast paced electro workout using the classic Drexciya template with a vocal that may or may not be ‘You Float’. In fact it’s so indistinct I wouldn’t be too sure at all on that, but if you want something to sing along with it then that works as good as any. There’s also some wind effects close to the end of the track that sound like someone blowing on a microphone, hey, I’ve done this myself, it works. On the aquatic tip the music is credited as being surfaced by Drexciya and apart from an artwork credit to Frankie C. Fultz there is no other information other than the standard UR label text. Beyond that we only have the artwork of side B to consider and this might be the closest we get to a resolution of what this is all about. Two eyes stare at us from clouds or fog over a choppy looking sea. Within the pupils are drawn some symmetric lines which could be anything really but they imply knowledge/wisdom in this figure. This may represent Drexciya as a body returning with knowledge from home. This also might be the ‘Sighting in the Abyss’ from the ‘Aquatic Invasion’ EP. Whatever it is it represents a hopeful sign emerging from the abyss/fog to guide us over the life-threatening rocks. That might simply be what this EP’s part in the story is saying, if you have come this far trust us to take you the rest of the way as we have just returned and can now act as your guide. Even Smokey tells us to trust them, the old man voice of wisdom metaphor used on ‘Wave Jumper’ also went some way to build up some trust and reassure us. For sure something big is being asked of us here, a leap of faith is being requested. Certainly the next release speaks for itself in that we are entering ‘Uncharted’ territory. Can we turn back, knowing what we now know have we even got that option anymore, how can we turn back? I never thought I’d find a context for this quote which comes from Martin Seymour-Smith describing the essence of what the gnostic Gospel of Truth is saying but here goes, “Help those dead to reality who want to awaken, to wake up, feed those hungry for knowledge of truth, for you (those awakened by gnosis) are the intelligent ones. Do not return to the old chattering parts of yourself. Do not go back to your old vomit. You have destroyed evil in you – do not fall into it again. Do the will of God for you come from God.” Maybe I'm going too far but this is basically asking how can we can possibly go backwards after coming so far and learning so much, why would we want to? Maybe this sort of extreme sentiment will be more relevant during the Storm series as it's promise is nothing less than Utopia, but for many the promise of 'Home', the ideal of it, what we imagine of it, would be enough. 'You Don't Know' and 'Bang Bang' made it onto The Quest and this EP was reissued on a sort of grey with a white swirl coloured vinyl by UR in 2003. Because I've pushed it a bit in this post to fill out the confusion of this EP I dug into the Stinson quotes again and found two for anyone needing convincing that James for one would have approved of this whole endeavour. This quote from Andrew Duke reassures, "Basically, we want people to tap into their minds and their creativity.” He went on to say, “...we kind of do that intentionally (create mystery) to stimulate their minds and take them deeper into the world of Drexciya. Instead of just laying it out there and making it dull and boring; once you have something that is a mystery, people enjoy that more.” Similar sentiments on this subject were expressed in the Beere interview, “We have concepts that you can actually think about and there might be a mystery there, or it might not be a mystery. It just might be fun to get into the concept and it makes you think a little deeper about things in your own life. To me, it makes the music exciting. Without it, it would be very dull. It would be faceless and nameless, and it's here today and gone tomorrow. We try and make it a little more interesting so if it's going to be around a long time and if you come back twenty-years down the line and play it for somebody else, you can tell a story behind the music. It has a reason to exist, a purpose. It lives, it breathes, you can smell it, and you can taste it. It's not like fast-food, this is a home cooked meal, a full-course.” Thanks for the fun James. 'Aquatic Invasion' came out as a 3 track 12" on UR in 1995. If for nothing else the lead track of the EP, 'Wave Jumper', has become something of a Drexciya standard. From this release I prefer 'Sighting in the Abyss' myself, but I'll get to the musical details later. The artwork and general vibe of the EP is very UR and it appears to have come out of a specific commission from that label. The following text from the artwork expands this mission further. "On February First Nineteen Hundred And Ninety Five the Drexciyan Tactical Seaforces received orders from UR Strikeforce Command, for one final mission. The dreaded Drexciya stingray and barracuda battalions were dispatched from the Bermuda Triangle. Their search and destroy mission to be carried out during the Winter Equinox of 1995 against the programmer strongholds. During their return journey home to the invisible city one final mighty blow will be dealt to the programmers. Aquatic knowledge for those who know." This is signed by The Unknown Writer. Crucially this is not Drexciya speaking here, even though I’m sure they would no doubt have discussed and o.k. 'ed the text with him. The Unknown Writer is part of the UR family and is one of its chief theorists and has had his words emblazoned on many of their releases. This theme of attacking 'the programmers' is still a constant for UR right up to today. It's quite obvious Drexciya had some sympathy with this viewpoint and were happy to be a part of it but it's worth stressing that on the surface this is very much a UR trip. In spite of this I’ll show how Drexciya still manage to include their own unique points undercover of the broader context of the EP. Some interesting and revealing vocals are found on ‘Wave Jumper’. We hear “You must face the power of the black wave of Lardossa before you become a Drexciyan wave jumper.”, “There are only two wave jumpers in existence today." and finally “Wave jumpers, catch a wave.”, all delivered in an old man type voice. So what does this all mean? If I’m right about what the ‘Black Sea’ of The Journey Home stands for then this black wave might be the same thing that we have to face/go through/overcome before we can begin our journey home, in this case worded as becoming a Drexciyan Wave Jumper. I suppose in their world to become an adept in wave jumping would be the final step of evolution, the end point, home. Of course this EP is historic in that it also marks the beginning of the wave jumping concept which at this stage would have been unclear as to what exactly this meant but would by the Storm series have come to mean dimensional wave jumping. The fact that the Unknown Writers text even mentions a ‘journey home’ could give credence to this. When speaking to Derek Beere in 2002 James Stinson himself saw the 'Wave Jumper' concept in terms of how Drexciya do business/interact with the public. "If you go back to the record "Wave Jumper", what that really was is how we do business with Dimensional Waves, which is we pop up in different spots in around the world and do releases. That’s the true definition of what a wave jumper is. We just pop up somewhere and there it is. We’re here for a second and then we're gone." But what else can we learn about this line of enquiry from the other tracks? Not a lot maybe, ‘The Countdown Has Begun’ tells us only that this process has started, a continuation of the previous ‘Living on the Edge’, ‘the time is now’ type insistency. ‘Sighting in the Abyss’ perhaps hinting at what is coming next as we emerge from the Black Sea/Dark Wave abyss. Why the old man voice, would this simply signify wisdom, someone we should listen to and trust? Again with the Lardossa references, truly this is a special place in Drexciya. The 'two wave jumpers' are of course Stinson and Donald but they are keen not to be the only ones as they beckon us to 'catch a wave'. It’s interesting to me that so much information has been lying latent in this music for so long now, even I never noticed it right away. I see it now as designed like a musical pyramid, it’s secrets hidden behind a beautiful facade, revealed only to the curious or those who know. I have shied away from using the over used and increasingly empty word genius regarding James Stinson and Gerald Donald but really they achieved something rare indeed with Drexciya and truly deserve our highest accolades. Musically ‘Wave Jumper’ is pretty funky, all sharp angles with the already mentioned strange sounding vocal interjections peppered throughout. 'The Countdown Has Begun' is much more slinky with a deep voice repeating the title throughout over some of their most darkly atmospheric sounds to date with a deep deep bass sound. Most surprisingly the track ‘Data Transfer’ from the fabled James Stinson solo project Clarence G’s ‘Hyperspace Sound Lab’ 12” bears a very close resemblance to ‘The Countdown Has Begun‘. I say most surprising because this came out in 1991! While Stinson might have had an uncertain start launching his music his production skills were there from the beginning. An updated AKA posting on this project is there now. 'Sighting in the Abyss' sounds much more like something from 'Neptune's Lair', in fact it also has an element of a Gerald Donald production feel, the bass line being very him but the rest is pure Drexciya. On the downside it's a bit short, sounding incomplete. In describing music I’m always reminded of the Frank Zappa quote that writing about music is like dancing about architecture. Really it’s a personal thing, we can’t help but hear, interpret and value things so differently from each other, so just take my view as a rough guide. While I'm covering what information we can gleam from the artwork etc we learn that it was recorded at '...Black Planet Studios on a Tascam 4 Trk'. Couple this with the date of 1st February and we have, for what it’s worth, a possible date and location for the ‘Aquatic Invasion’ session. Although not all the tracks might have come from then, as I explained above I would guess that ‘Sighting in the Abyss’ came from their own studio. I presume that while a 4 track is undoubtedly primitive, but effective, they mean a reel to reel machine and not the Tascam audio cassette 4 track model, although this is also an effective machine. I suppose giving us this detail could be UR showing us that they are more concerned with creativity than technology. The artwork comes from a regular UR contributor but is also historic in that it is the first artwork used so far that depicts Drexciyans. What we get is some nice renderings of two ‘Drexciyan Commandos’ jumping from a helicopter into the sea ‘somewhere in the Atlantic’. The other side is of a close up of one of the commandos masked faces with breathing apparatus evident. Only ‘Wave Jumper’ was selected for The Quest compilation and I presume this EP was also briefly reissued in 2003 by UR, although its Discogs listing does not mention it. Certainly there is plenty of scope for a good quality second volume of The Quest someday. You might be thinking that I’m underplaying the whole ‘Aquatic Invasion’ aspect here, putting it down to being more of a UR thing, but really there is still a strong parallel going on between both concepts. What better way to attack the programmers, the mainstream media, than with this slow fused message. Not long after this Drexciya would do their only remix for UR’s ‘Electronic Warfare’ release which itself was an extension of this theme. The communication war has begun, our minds invaded by both sides, will we recognise the truth from the lies? 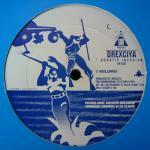 So that’s Drexciya’s 6th release covered, ‘The Return of Drexciya’ is next. Don't despair if there are some lengthy gaps between these postings, I won't bore you with my other pre-occupations, it will be done; I also would rather take the time to make sure the piece does justice to its subject. On the topic of why present this as a Blog, to be honest I'm not particularly a fan of the typical diary style blogs and just see it as an effective way to generate feedback, plus it serves it's purpose well enough. The only thing to remember being that if your a new reader it makes more sense to start from the beginning.